Even in the days of GPS devices, the ability to relate to what’s around you with what is displayed on a map is a vital skill. Put the compass away and teach kids this skill first. Map reading is an essential outdoor skill. Sorry. I’ll correct that. Landscape reading is an essential skill (more on that later). With GPS devices prevalent these days, you may have older kids with a GPS device built into their phone. Unfortunately, without understanding maps, all they learn with a GPS is to walk from point A to point B…. as per the device’s instructions. Give them a large map and they’re lost. 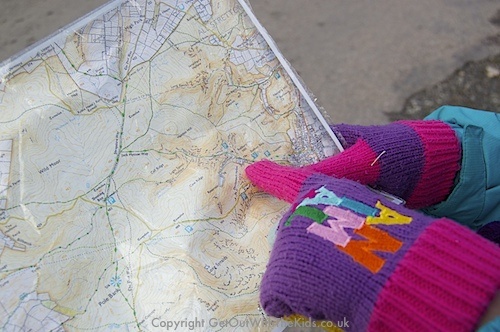 Here are some tips on how to introduce your child to map reading. Don’t start them with the compass. Yes, you could give a compass to young kids, who will like trying to get the needle to move, but this is a distraction from learning to map read. Compass navigation skills come later once your child has a good understanding of maps. I would recommend that this is done in conjunction with GPS devices (if they are familiar with GPS devices), as you can easily relate what they are familiar with with the non-technical equivalent. The Ordnance Survey produces great maps. However, they can be big and unwieldy. Shrink yourself down to kid size and it’s like trying to read wall paper. Rather than buying lots of expensive maps, you could use OS getamap (read our review here), print out a small map section, and stick it in a document wallet (a lot cheaper than a map reading case). A map is nothing more than squiggles and symbols. Teach some basic symbols before going outside. You need to teach map skills in stages. Don’t do it all in one go as you’ll just overwhelm them and they won’t learn as well. 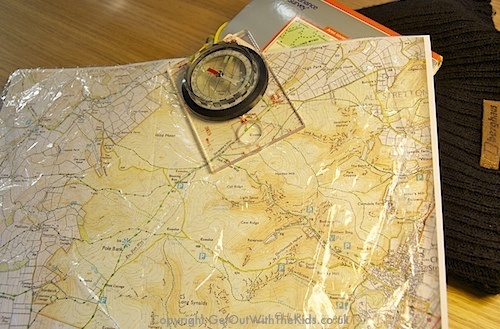 Plan ahead an area for their first map reading navigation, and only teach the symbols relevant for that walk. If you have more time, map symbol bingo can be a fun way of teaching. (Click here to download our free Map Symbol Bingo game). We also have a few more resources, including a Map Symbol Quiz in our Family Navigation course. Contour lines can be very confusing. At this stage, you need to explain the theory behind them. When you get outside you solidify that understanding with what they see around them. Each child is different so you’ll need to pick a way of explaining that works for your child. Get across that the lines are showing how the hill is sliced up. Here’s a suggestion for helping to explain contour lines. Using Lego, build up a hill shape. Ask your child to draw onto paper the outline shape of each layer by looking down from above the hill. Show how the contour lines on the map equate to the outline of each layer of bricks, and they should see that’s exactly what they drew. Focus on the top of the hill, and show how this is is the small ‘circle’ shown on a map. These are easier to spot on the map. They should then see how the contour lines are just the outline of the layers if you were looking directly from the top of the hill. Include in your hill a steep side. Show how the lines between the layers are close together for steep areas on the map. Show this on the Lego model. 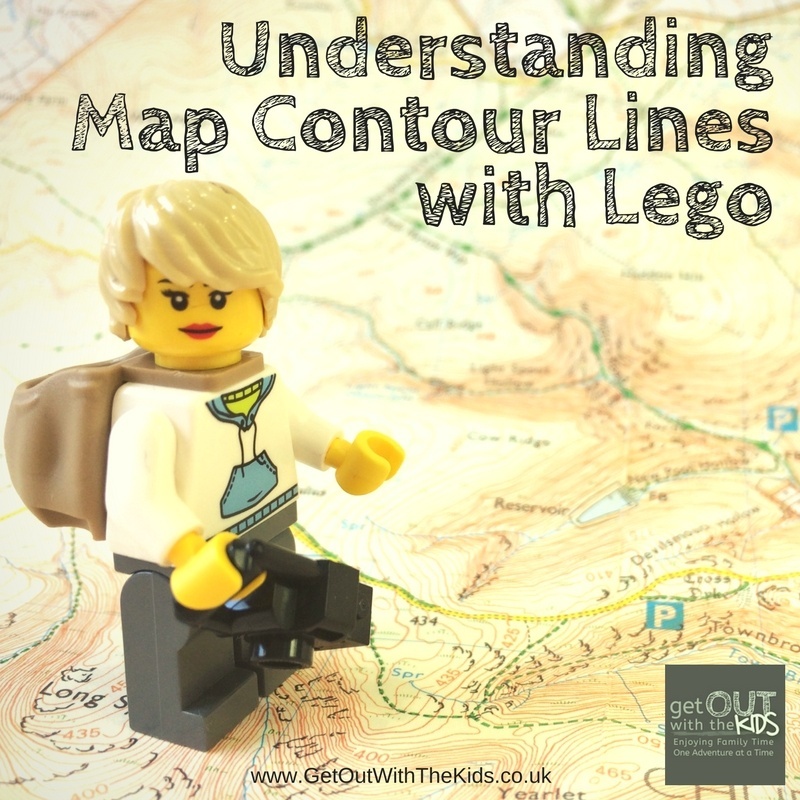 We have a step-by-step illustrated guide that shows how to use Lego to illustrate map contour lines to kids. It is in one of the lessons in our Family Navigation Course. Choose a region that’s fairly easy to navigate but has some different features. An area with hills is the best as this will help illustrate contour lines. The goal here is to teach them how to read the landscape and relate that to the map. Point out any hills around them and get them to find them on the map. If you have two hills close together that are near you, that should be easy to find on the map. Ask them to find your current position. You may be still in a car park at this point, which would be easier to find (especially if you told them what a car park symbol is). Ask them to locate another a place on the map, such as ‘something Church’ or ‘someplace lake’. Only help them if they’re getting really stuck, but even then, just give them suggestions rather than pointing to it on the map. Now, ask them to take you there. Get them to lead, even if they go slightly wrong. Every time there is a feature that can help them identify their current position on the map, remind them to check to see where they are. Such as crossing a stream, a fork in a path, or crossing a road. A reward when you get to the destination is a good idea. If you follow the steps outlined here, your child will be less daunted by maps. The ability to observe what is around you to what the map is showing is an essential skill. Once mastered they would be able to find where they are on a map without the need of GPS. They will also be able to look at a map and see what the terrain is like further ahead on their route: something that is essential for safe route planning. The image below summarises how to teach kids basic map reading skills. Print it. Pin it. Here are a few other things from around the internet that you may find useful when teaching your child map reading skills (links open in a new browser window).  The Family Navigation Course – A collection of weekly activities that families can do that helps them get to grips with map reading and basic use of a compass. 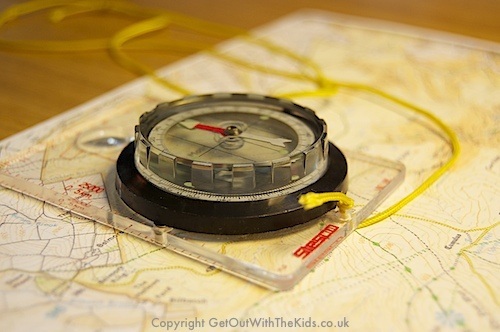 Ordnance Survey ‘Map Zone’ – A website aimed at kids to help teach map skills. 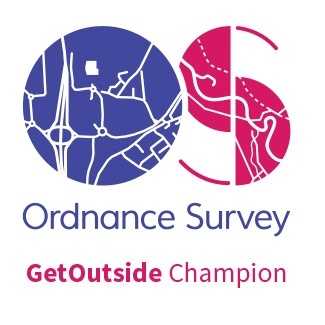 Ordnance Survey ‘Get A Map’ – Electronic access to O/S maps. Ordnance Survey ‘Map Reading made Easy Peasy’ – The OS guide to map reading. 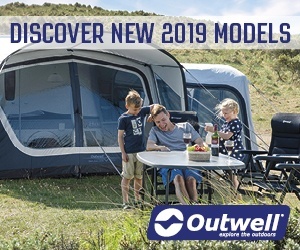 Thank you this is going to be an excellent tool as I am in the Lake District with my two children and we are going to be leaning about reading a map. Thanks Lynn. Glad the post’s helpful.